Hi, everypawdy! I told you yesterday that my human said that Jacey and I are banished from the balcony for a while. This did not make me happy. Just because I am a diabetic cat doesn’t mean that I don’t like to enjoy soaking up the sun. And I especially like nibbling on the catnip that my human is growing on the balcony. But my human tells me there is a good reason for our banishment. We cats are predators. Nature designed us to be good ones. Our sharp claws, sharp teeth, and lightning quick reflexes make us very good at killing prey. And we really enjoy hunting birds. That is what is nesting on our balcony these days. You can see the pretty mourning dove that has decided to lay its egg right next to the basil plant that my human planted. Humans who live in the United States probably have seen these birds. They are very common birds, and they live pretty much throughout the entire country. They make a very distinctive sound. You probably have heard it at some point. They are very adaptable birds, and they live pretty much anywhere. While they normally nest in trees like most birds, in the western United States where I live, they will often nest on the ground. That is what they decided to do here. 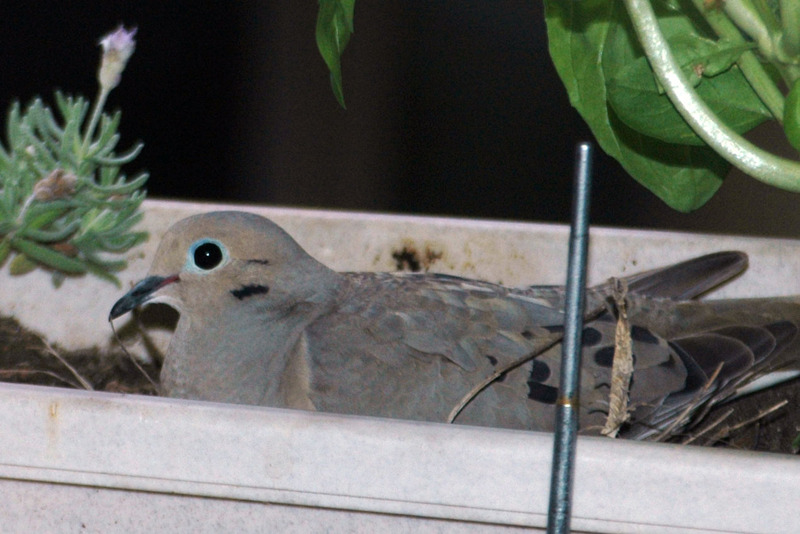 They decided to nest on the soil in the planter box where my human planted basil. Mourning doves pairs take turns incubating their eggs. Typically, the male will incubate the egg during the night, and the female will incubate the egg during the day. So Jacey, our human, and I get to see two different birds. These pretty birds are fun to look at, but even though Jacey and I told our human that we will not attack the bird, he knows better. Fortunately, we won’t have to wait too long. The typical incubation period for a mourning dove is about two weeks, and then the baby mourning doves fly away after another two weeks. I guess that is okay. We typically have something called June gloom here, and while diabetic cats love to lounge in the sun, there isn’t much to lounge in when it’s here. So I should be able to head back out to the balcony right around when it gets sunnier in July! You better believe that I am going to show my human how much diabetic cats like the sun when I get the chance.